The second song from Akshay Kumar's Kesari, titled Ajj Singh Garjega, has been released and it will instill a sense of pride in you. Kesari is based on the Battle of Saragarhi in which an army of 21 Sikhs fought against the Afghans in 1897 and Ajj Singh Garjega features snippets of the war. Kesari rang ka matlab samajhte ho? Bahaduri ka rang hai. Shaheedi ka, Akshay's character declares in Ajj Singh Garjega, as the actor, in his khakee uniform and turban, puts up an intense fight with his army against the Afghans. Ajj Singh Garjega has vocals by Jazzy B and has been composed by Chirrantan Bhatt while Kunwar Juneja has written the lyrics. 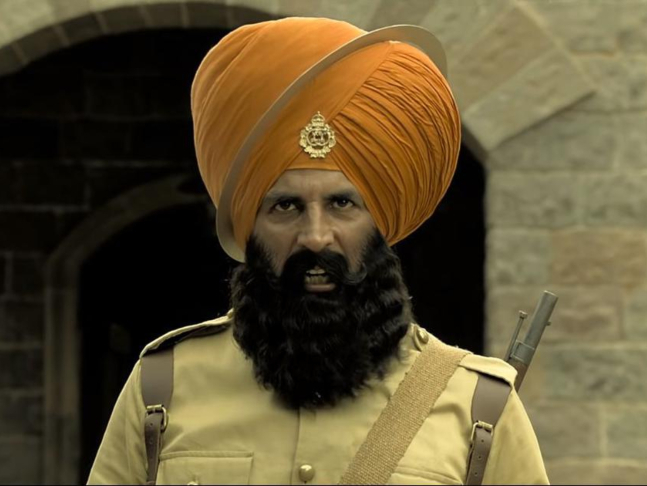 Sources said that Ajj Singh Garjega is one of Akshay's favourite tracks from Kesari and he is of the opinion that the lyrics of the song are powerful enough. “Akshay was extremely moved by the powerful lyrics of the track. Along with the sequence, it also stirred sentiments of nationalism that the characters feel in the movie," sources said. Produced by Cape of Good Hope Films and Karan Johar’s Dharma Productions and directed by Anurag Singh, Kesari, co-starring Parineeti Chopra, is scheduled to release on March 21.